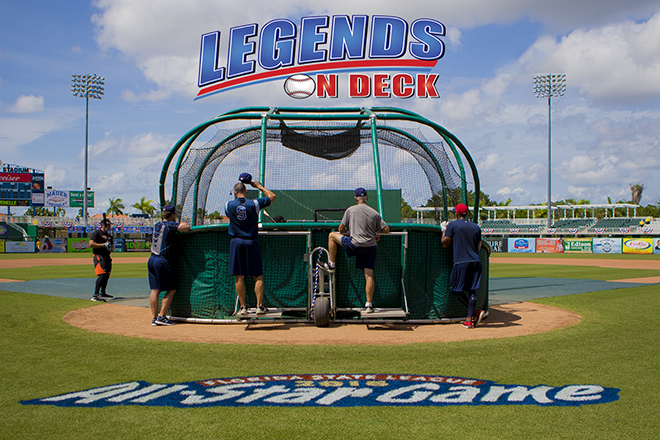 The 55th Annual Florida State League All-Star Game festivities kicked off on June 18th beginning with the Home Run Derby, at Hammond Stadium, home of the Fort Myers Miracle. Representing the North Division in the HR Derby is, Joe Pankake (Lakeland Flying Tigers – DET), Ryan McBroom (Dunedin Blue Jays – TOR), Mitch Walding (Clearwater Threshers – PHI), and Aristides Aquino (Daytona Tortugas – CIN). For the South is Tomas Nido (St. Lucie Mets – NYM), Taylor Gushue (Bradenton Marauders — PIT), Taylor Ard (Jupiter Hammerheads – MIA) and Trey Varva (Fort Myers Miracle – MIN). FORMAT: In the first round, the 8 hitters will receive 5 “outs”; an out is defined as any swing that is not a home run. The top 4 hitters advance to the second round. The second round is the same process– each hitter receives another 5 outs, but their HR total from the first round carries over. The top 2 aggregate HR hitters between the first and second round will advance to the Final round. In the final round, the home run count is reset to zero. Hitters will then have 5 last “outs”. Whoever posts a higher HR total in the final round will be crowned the 2016 Florida State League Interstate Batteries Home Run Derby. After a long battle full of dingers and almost a stinger to our very own photographer, Legends On Deck’s Gabe Rodriguez, Mitch Walding of the Clearwater Threshers came home with the the 2016 Home Run Belt. Though he started slow and scraped by to get to the second round with just one home run in the first round. But once he hit the ball out, it was hard to stop. Walding would send absolute missiles out in the second round hitting 3 deep HRs. In the final round, Walding would battle it out with slugger, Ryan McBroom of the Dunedin Blue Jays. And on his last pitch Walding would hit the Home Run Derby winning shot. The results of the 2016 Home Run Derby has been posted below.